We’re in the thick of summer here in Virginia- and boy is that heat exhausting! Several of you are probably experiencing similar weather and on top of that, working outdoors for the majority of your day. 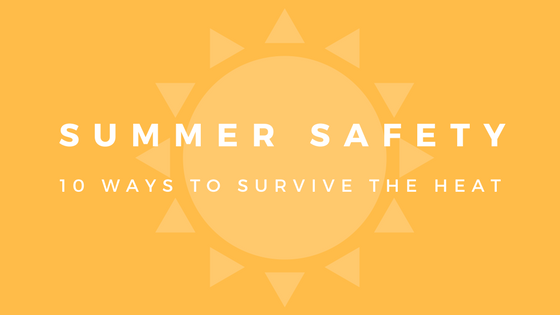 Therefore, we thought it was the perfect time to throw it back to one of our older posts with tips on how to beat the heat! Save the best for last. Well, save the easiest for last. If you’re working outside all day, get the heavy lifting/labor intensive work done first during the cooler hours of the day, saving the less strenuous work for the hotter hours. Embrace the farmer’s tan. As tempting as it can be to work shirtless outdoors, it is definitely best to be protected by clothing when you’re on the job. To stay cooler, wear loose clothing that lets your body breathe a bit and avoid wearing dark colors, as they soak up the heat. Keep buckets of water on hand. Fill an empty bucket with ice water to keep water bottles cool or wet washcloths. Squeezing a wet washcloth on your neck or wrists is an effective way to keep your body temperature down. A cooler works as well, as long as you don’t mind it filled with dirty washcloths! Protect your head. We’re talking the whole nine yards here: hat or helmet with a brim, sunglasses, and definitely sunscreen. It’s important to protect your head with a lot of outdoor work in general, but the heat makes it even more crucial. Keeping the back of your neck shaded can even make the rest of your body feel cooler. Take a breather. Short but frequent breaks tend to be best when working long hours outdoors. Find time throughout the day to just take a couple of minutes to break between tasks and let your body cool down and re-energize. If you often lose track of time while working, set alarms on your phone or watch to remind you to take these breaks. Drink frequently. On your short breaks sip some cool, not freezing cold, water. You don’t have to overdo it, but make sure you are sipping water regularly. It is important for you to stay hydrated throughout the day, especially in the heat. But no coffee or beer! You may feel like you need a caffeine boost or a refreshing beer here or there, but both are proven to make you more dehydrated. Stick to water and save that beer for after work. After all, it can serve as motivation to work towards enjoying a nice cold one once the day is done! Build up a tolerance. No, we’re not talking about alcohol anymore. Instead, we are talking about building a tolerance to heat. If you’re not used to working in it, then don’t over exert yourself on your first day in the heat. Be sure to take lighter work loads and work less hours while you are getting used to the climate, instead of overexerting yourself right away. Rotate tasks. If you’re working with multiple people, then take shifts doing some of the more strenuous jobs. This way all of the work can continue to get done with less chance of anyone on the job suffering from heat stress. Listen to your body!!! It has some pretty important things to say. Do not ignore signs of dizziness or feelings of lightheadedness while working out in the heat. Heat has the ability to sneak up on you, so if your body starts to warn you that something is wrong, make sure to take a break and drink some water right away! For more information on heat safety check out this article by OSHA, who launched their Heat Illness Prevention campaign in 2011 to educate employers and workers on the dangers of working in the heat. Remember your safety is always the #1 priority, so make sure stay aware of your conditions and stay cool while on the job!